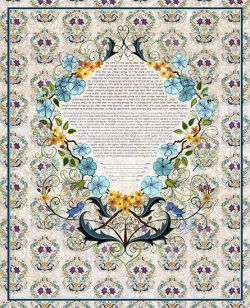 The flowers, branches and vines are entwined in your ketubah, signifying the interweaving of your lives in marriage. May your union be filled with happiness and may your Entwined Ketubah become a welcomed source of joy, illuminating your home for years to come. * For personalized ketubahs, the above timeframe BEGINS when we receive your COMPLETED KETUBAH WORKSHEET. * If you select personalization in less than four weeks, an additional RUSH SHIPPING fee will apply. Free ground shipping is NOT available for personalized ketubot to be delivered in less than four weeks. This is necessary to ensure timely delivery of your ketubah. Thank you for your understanding. Karla Gudeon is a storyteller. She culls her images from her own cultural heritage and family lore. It is through Karla's natural ability to tell a story, her humor and wit, that her work attains its universal appeal. As with the best folk and lyrical art, Karla's work is wholly accessible while encompassing emotional honesty and layers of meaning. Her chosen medium, the limited edition dry-point engraving, allows her work to circulate to an ever widening circle of collectors and admirers. Each print, hand-watercolored in bright, rich hues, remains truly unique. The imagery, interpretations, and stories embodied in these works touch the soul and warm the heart of the observer.